The Community Music School of Webster University hosts a free concert with The Euclid Quartet on Saturday, Feb. 3, at 6:30 p.m., in the CMS Concert Hall. This concert is part of the CMS Preparatory Program's Annual St. Looey Chamber Blitz, a weekend intensive featuring an ensemble-in-residence, and a free concert. This year's guests are the Euclid Quartet, formed in Ohio in 1998 and constituting a multinational mix of members representing four continents: violinist Jameson Cooper (Great Britain), violinist Brendan Shea (United States), violist Luis Enrique Vargas (Venezuela), and cellist Jacqueline Choi (South Korea). 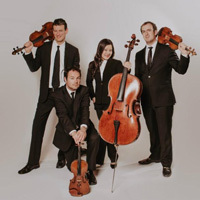 Captivating audiences and critics ranging from Carnegie Hall to school classrooms to radio and television broadcasts, the quartet consistently performs to enthusiastic acclaim throughout the country. As part of the concert, the Euclid Quartet will be joined by students from the CMS Preparatory Program and paired onstage with younger CMS string players. This stunning large ensemble piece will be a world premiere arrangement of Schubert's "Death and the Maiden" based on Mahler's string orchestra version. Founded in 1925, CMS offers outstanding music education and performance opportunities to students of all ages and abilities and serves the entire St. Louis metropolitan region. CMS' Preparatory Program (Prep) is designed to augment the individual music study of exceptionally talented string, woodwind, brass, and piano students who anticipate pursuing a career in music. Utilizing the vast artistic resources of the Greater St. Louis region, including the St. Louis Symphony, area University and other music professionals, as well as Community Music School and Webster University faculty, the Preparatory Program offers high caliber instruction, performance opportunities, and artistic mentoring in one comprehensive curriculum focusing on chamber music. The Community Music School of Webster University is accredited by the National Association of Schools of Music and is a certified member of the National Guild of Community Schools of the Arts. The Community Music School receives assistance from the Arts and Education Council of Greater St. Louis. The Preparatory Program is supported in part by an award from the National Endowment for the Arts.